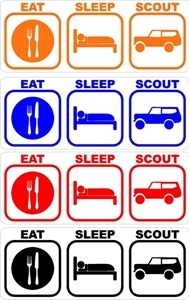 The decal that explains what the Scout life is all about. Add this decal to your collection. It measures 10" x 3.8". Made of high quality vinyl. Simply remove the backing paper and apply. Made to lay onto the raised lettering on your Scout 80 or 800 tailgate.